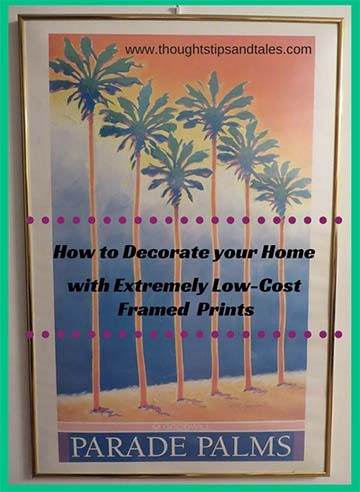 The cheapest way to hang nice-looking framed prints in your home is to buy them at a yard sale or thrift store. I was able to get the three prints in my living room, which have similar frames (gold wood) and styles, as well as the four prints in my bedroom (which also complement each other and have gold wood frames) at yard sales. Another option is to buy a print inexpensively at a yard sale, thrift store or online discount merchant. Then buy a frame in the correct size at a thrift store or yard sale and insert the print. Local Goodwill stores in my area display a “secret number” each week and every item in the store with the number on its tag is discounted by 50 percent; many times framed prints are assigned the secret number. Instead of buying an expensive print and taking it to a frame shop, paying hundreds of dollars to have it matted and framed, you can spend as little as $10 for a great looking framed print whether bought together or individually! Recently, I bought a framed poster (with scratches on the glass) for $6.99 and a separate 20 x 30 frame that fit the poster (which contained a print I didn’t like) for $6.99 — they each were tagged with the secret number. I put the pretty poster inside the pretty frame and got it all for about $7 (see photo above). The downside is you usually have to be patient enough to check thrift stores and/or yard sales for several weeks after you buy a print before finding a frame you like that’s the right size — but the money saved is well worth it. Thrift Store Treasures #2: Bare Traps Sandals — Love Them! This entry was posted in bargains, framed prints, pictures on the wall, prints, problemsolvers, save money on framed prints, saving money, wall art, wall decor, yard sale and tagged bargains, framed prints, pictures on the wall, prints. framed prints, save money on framed prints, saving money, thoughts tips and tales, thrift stores, wall art, wall decor, yard sales. Bookmark the permalink. Are there standard sizes that this works best with? I definitely have prints to frame but they are odd sizes so I don’t know if it’s be worth checking out used frames -although I do hate framing prices! There are some standard sizes that are easier to find – like poster size, 8 x 10, 16 x 20. I always measure the print and stick that measurement and a small tape measure in my purse before going to yard sales and thrift stores. Something else you can do if you have an odd-sized print is to go to a craft store, like Michael’s or A.C. Moore and use their weekly 40 percent off coupons to have them make a mat that covers the area between the edge of the print and the edge of the frame. That wouldn’t cost much. I’ve seen Michael’s offer 50 percent off framing coupons fairly often that might work, too. Or…you could use pretty paper (like scrapbooking paper – obtained with a 40 percent craft store discount coupon) and place that in the frame behind the print, if the print is smaller than the scrapbook paper and frame. Or you could put wrapping paper behind, or almost any kind of paper – a pretty gift bag, etc.